Legend has it that a cross-breeding between a domestic bobtail and a male tabby cat on an Indian reservation site on the late 1960’s resulted in the American Bobtail. 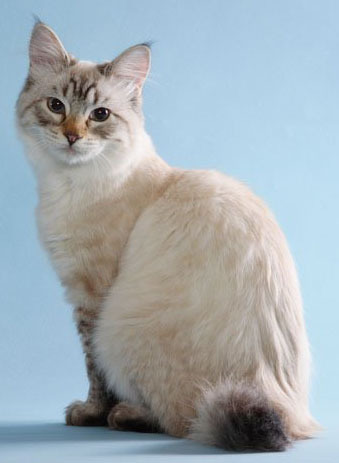 The kitten was found by a couple and cross bred with a long tail female and the resulting offspring laid the foundation of the American Bobtail lineage. Unfortunately, none of the original bloodlines are still alive today. The American is not related to the Japanese Bobtail, despite the similarity in names. The difference in American Bobtails lies in their coat- some American Bobtails have short haired coats, while others have long haired ones. The most notable physical attribute of the American Bobtail is its stubby, bobbed tail which is about a third or a half the length of a regular cat’s tail. Its coat can be described as shaggy, giving it the appearance of a wild animal. Their coat as well as eyes can be of any color. It is a medium to large cat. Owners and breeders of the American Bobtail have described it as an extremely playful, friendly, energetic and intelligent cat. In some cases though, it may be born scared and may take a little while to open up to its owners. They are considered to be great family cats as they get along with children as well as other animals. They are also known to be great climbers and can get out of cages, boxes and closed rooms easily. There is no specific caring required for American Bobtails, but they are known to have a lot of health issues, especially in older age. Somebody just jeered on american bobtail cats. It’s impossible to see them with such short tail!!!! It’s common to see them with tails like that. They’re born with short tails. 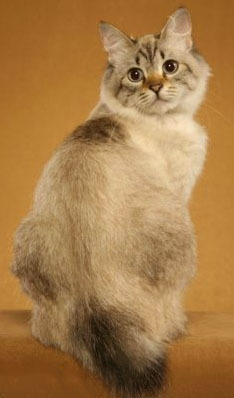 But not every American bobtail will have a short tail, there are also a lots of them with normal sized tails. We too have a kitty with only half a tail. It’s not bobbed, it is literally just HALF a tail. His sister has a tail that is way longer than other kitties. It’s strange…it’s like she got the portion of his tail he’s missing. LOL They are both such sweet temperament kitties. Hubby looked up their fur types and said they match the description of Rag Doll and something else…their fur is like rabbit fur…so so very soft. Anyway, Duke, the one with the half tail…at the end of his tail the bone kind of branches off into a V. It’s really strange. I don’t feel he was ever injured and had some traumatic event that happened to his tail because we adopted he and his sister when they were dumped off and they were only around 3 weeks old. We bottle fed these babies around-the-clock. Does anyone know what would cause Duke’s tail to have that forked tail (other than he is a devil kitty) ? It’s funny that there seemed to be quite a few running around my block. I think someone tried to breed them but they were stupid about it since they didn’t give the female time to recover from delivering before getting her pregnant for the next litter of $$$. I think with each litter the kittens got sick and they are dwindling down. I have a Japanese Bobcat/tabby he only has half of a tail, he is white with tabby saddle and rings on his tail. Loves to play and follow me around. My friend next door is jim, he has one of this kind of cat at his place! I breed this wonderful type of cat and who says they have “a lot of helath issues”? Even in older age, which is about 17-20 years; they are a hardy healthy breed!!! !